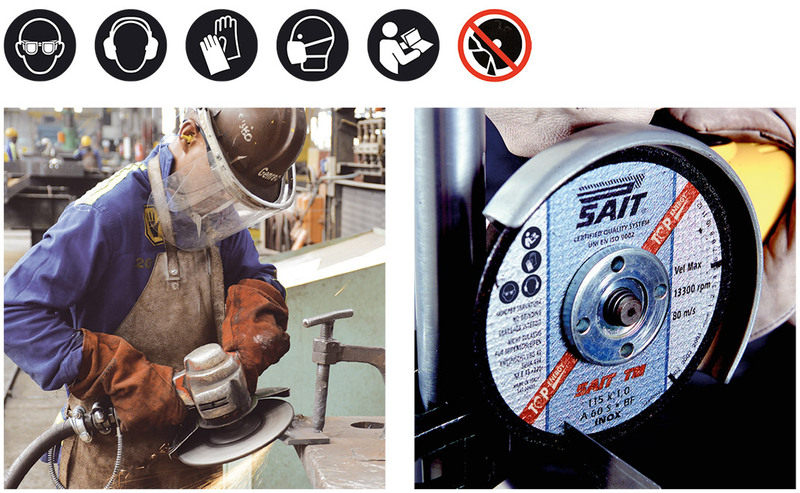 SAIT abrasive products are manufactured and tested to ensure a high degree of safety for the operator. The machines used should be equipped with all required safety accessories (guards, screens, etc.) Accurate mounting is essential to maintain the safety standards and to achieve the best output from the abrasive tool. The maximum operational speed must not exceed the one recommended for each individual product. Every operator must be protected by glasses, gloves and protective cloths against the possibility of material being projected as well as anti-dust masks and hearing protection. The use of these tools can cause noise equal or superior to 85 dBA; the operator must therefore wear protective ear muff or other suitable personal protections.